Great works of art or literature often share a truly special feature - they tie together ideas, people and places spanning many eras and summate them in manner that not only makes them relevant for the audience it was created for, but resonates just as strongly through time. This can be easily said for the works of Homer, or Shakespeare - maintaining as strong a presence in modern scholarship and popular media. The Commedia, by Florentine writer Dante Alighieri is believed to have been written between 1308-1312 CE. It was later given the nickname Divina by Florentine writer Boccacio, and has since become commonly known as The Divine Comedy. The Commedia is a seminal work at levels reaching far beyond the Medieval audience which originally received it, and is considered one of the most important works of Western Literature. The image below was painted by Early Renaissance artist Domenico Di Michelino and depicts Dante and the Three Kingdoms(1465). These kingdoms are Mt. Purgatory(in the middle of course! ), Hell on the left and the 'Heavenly City' on the right. In this instance - this magical city happens to be Florence - as evidenced by the famous Dome built by Brunelleschi. It is interesting to note that the dome pictured actually did not exist in Dante's day. Countless theologians, scholars and artists have spent quite a lot of their energy analysing, illustrating and postulating on the significance of the Commedia and its detailed religious symbolism - with Dante essentially providing a roadmap for Heaven and Hell, allowing one to reference what punishment awaits certain behaviours, and who you are likely to find yourself in company with. Dante's work is also interesting to consider as an historical document. What drives someone to write such a work? In Dante's case, it is not a case of blind religious fervour, but instead the grave subject matter was chosen to showcase the capabilities of a language which Dante believed to be ready for mainstream use - Italian. It needs to be mentioned that the political makeup of Italy in the Middle Ages and Renaissance eras was different to the unified Italy that we now know. Although the landmass has been called Italia (denoting its Southern position in Europe) since Antiquity, post-Roman Italy became divided into many separate Kingdoms or City States. Florence was one of the more prominent of these - and it was with Florence that Dante had a strong personal and political connection. Due to his involvement in various political intrigues, Dante spent much of his later life exiled from Florence, and to this day his remains are located in Ravenna. Despite appeals from from later rulers of Florence to have the remains returned, Ravenna refused, and hence there they stay. 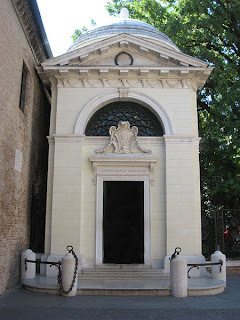 An 18th Century tomb for Dante's remains at Ravenna. It contains the inscription parvi Florentia mater amoris "Florence, mother of little love" denoting the bitterness of Dante's exile from his beloved city. The religious and political connotations of the Commedia often make it difficult to view it as an historical document. Like other texts strongly associated with spiritual subject matter, it takes on an aura that makes dicussing it as an historical document difficult. To those uninterested in the sinners, the map of Hell and the lamentations, it is perhaps more interesting to know that the Commedia did two very interesting things. Firstly, it established the Italian language, and secondly, rejuvenated the career and international profile of Roman poet Virgil. It could easily be argued that Dante paved the way for the renewed embrace of the great writers of Antiquity that characterised the Renaissance. 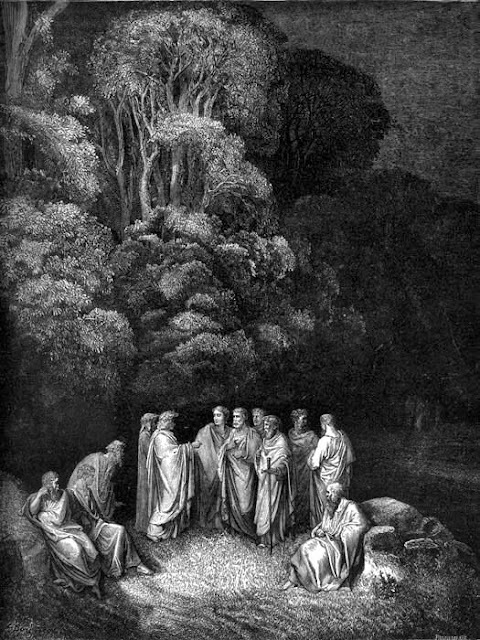 Even in Dante's roadmap of the afterlife, Socrates, Homer, Plato Virgil and his contemporaries are not condemned for being non Christian, but given a cushy spot in Limbo replete with forests and a castle. It is stated that they cannot be wronged for being born at a time when they could not be aware of Christ, and are instead exempt from punishment by the strength of their virtuous actions. Virgil himself lived during one of the most tumultuous periods in History, bearing witness to the end of the Roman Republic and the beginning of the Roman Empire - first under Julius Caesar and then under his great nephew and adopted son - Augustus. Virgil's most famous work, the Aeneid (29-19 BCE), whilst being a precious remnant of classical literature, was at it most basic level a propaganda tool celebrating the divine origins of the ruling family of the time. 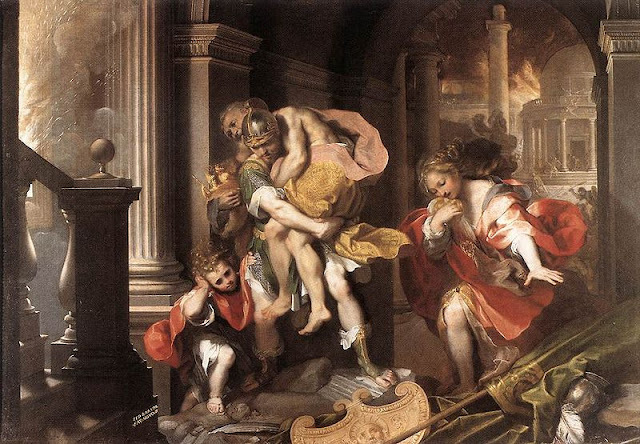 The Aeneid is an epic story, which attempts to draw a direct hereditary link from the Caesars to Romulus(the founder of Rome) and even further back to Aeneas, a hero of Troy forced to flee his beloved city after its destruction by the Greeks. It was believed that Aeneas mother was goddess of love and beauty Venus(aka Aphrodite), whom had an earthly affair with Aeneas father. The Romans were quite proud of this divine heritage, and it was prominently displayed in public artworks and literature such as the Aeneid. 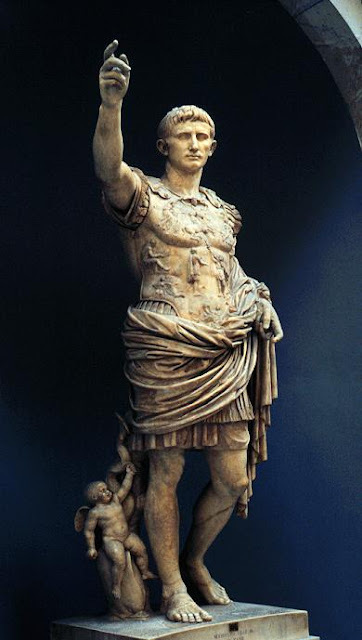 The most famous of all Roman statues, The Augustus of Prima Porta once dotted the empire during the reign of Augustus. The dashing figure of Augustus has at his feet Cupid riding a dolphin. With Cupid being another son of Venus/Aphrodite, this was another direct reference to this claimed divine heritage. 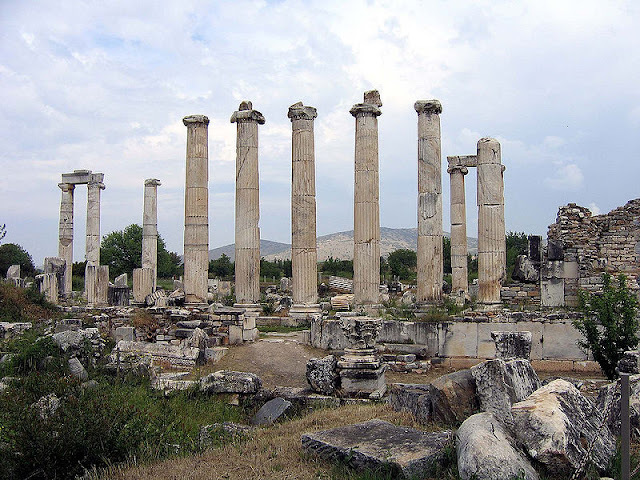 This devotion extended beyond a public image ploy however, as the Imperial treasury put vast sums into building projects honouring the Goddess, such as the city of Afrodisias(in modern day Turkey) and the rebuilding of Paphos in Cyprus following an earthquake. During this period, Paphos was renamed Augusta, further affirming the Emperor's reverence of the birthplace of his divine ancestor. 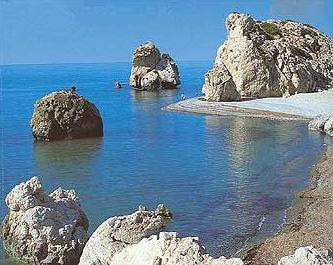 Petra To Romiou, or Aphrodite's Rock in Southern Cyprus, not far from Paphos/Augusta. As described in Greek (and Roman) mythology, this was believed to be the birthplace of the famous goddess of love and beauty. In present day, this Island is inhabited by a Greek and Turkish population - each of whom refer to the island by an ancient name of the Goddess, Kypris. Augustus of Prima Porta was unearthed in 1863 and can be viewed at the Vatican Museum in Rome. The Temple of Aphrodite at Aphdrodisias. During the reign of Augustus, Aphrodisias became famous as one of the most beautiful cities in the Eastern part of the Roman Empire. The earliest existing manuscripts of the Aeneid are from the 5th Century CE. From accounts by other Roman writers, such as Suetonius The Lives of The Twelve Caesars, we are told that on his death bed, Virgil ordered his work to be put into the fire. Luckily for scholars of Latin poetry and students of History, it was saved from this fate. Whatever the the political motivations of the Aeneid were, it remains an important example of Latin poetry and a 'ripping yarn' at many levels, with melodrama, political intrigue and many epic battles. 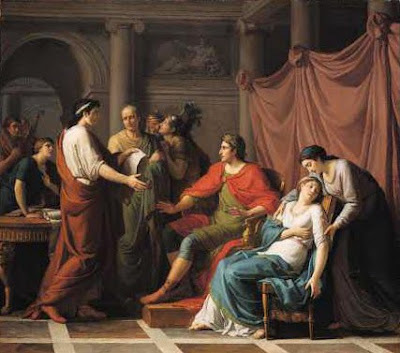 Jean-Joseph Taillasson's Virgil reading the Aeneid to Augustus and Octavia painted in 1787. It depicts a scene described in Aelius Donatus' 4th Century Biography(Vita) of Virgil. A scene in the Aeneid describes the ghost of Marcellus, Augustus dead nephew. It was said that Marcellus' mother Octavia fainted during a reading of this. Despite its prevalent Pagan themes and rituals, Virgil's Aeneid was held in deep regard during the middle ages. There are several good reasons for this - scholars and historians were interested in the work as an example of Latin Poetry and as an historical document. The people of Rome, and Italy itself felt a bond to the work, it describing the origins of the great city and the ordeals of their Trojan and Etruscan ancestors. Furthermore, the Roman Catholic Church could not bring itself to have the work outlawed because of the Christian-like themes raised in the Aeneid, the more obvious being a yearning for peace and brotherhood, and the identification of a chosen one that leads the people and instructs them as to the importance of religious ritual. (The Aeneid is teeming with descriptions of Aeneas performing acts of piety...albeit Pagan ones). Thus revered, Virgil was an ideal candidate as a guide for Dante in the Commedia. Being a designated resident of Limbo himself of course, even poor Virgil can not enter when Dante's travels bring him to Heaven(Paradiso)! But for the rest of the trip, Virgil is Dante's trusty guide. The Commedia has been at the centre of many great artworks throughout the centuries. Starting from illustrated manuscripts, printed versions and subsequent painting and sculpture that appeared in the Renaissance and beyond. 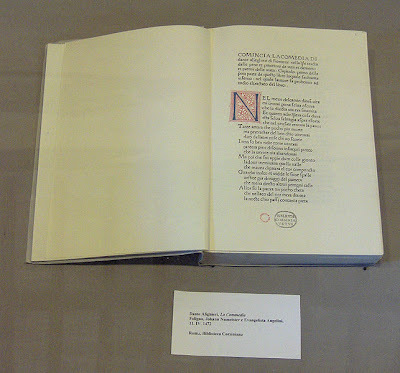 One of the first printed editions of Dante's Commedia, dated 1472. Perhaps the most famous of the artworks derived from the Commedia is Eugene Delacroix La Barque de Dante, sometimes referred to as Dante and Virgil in Hell. It was completed in 1822 by Delacroix when still in his twenties. The muscular figures and dramatic poses draw direct inspiration from Michelangelo and Rubens respectively. This painting represented a shift away from the controlled Neoclassical style of painters such As Jacques Louis David, and began to move towards the Romantic style. 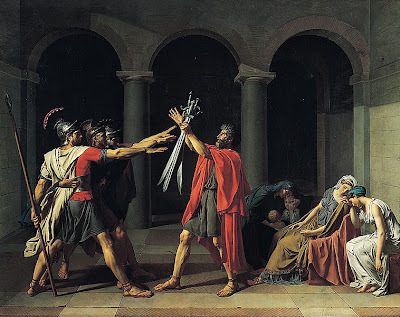 Oath of the Horatii by Jacques-Louis David (1784). The increasingly sterile and crisp Neoclassical style led way to more daring artists trying more expressive techniques. Delacroix Dante painting was to set the scene for the next wave of art in the Romantic style. The Dante Painting also draws inspiration from a more contemporary source, with direct references to Theodore Gericaults's The Raft of Medusa (1819). This amazing image has had tremendous influence in art and multimedia since its initial unveiling. It is a depiction of the raft fashioned by crew of the French Naval frigate Meduse, which ran aground near modern day Mauritania in 1816. It was recorded that 147 people made it aboard a hastily made raft, with all but 15 of these dying over the 13 days before help arrived. The survivors endured starvation, dehydration and eventually turned to cannibalism. It still remains one of the most infamous incidents in Naval History. 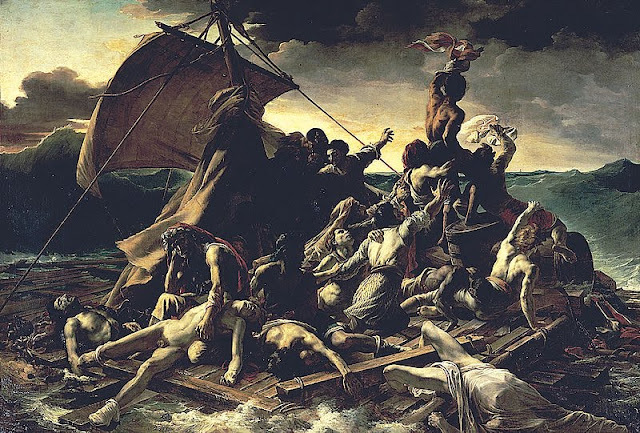 The scene of the Persian ships forced aground by storm in Zack Snyder's 2007 film 300 is a modern day example of the far-reaching influence of Gericault's astonishing image. One of the figures from the Gericault's Raft reappears in Delacroix painting as a lost soul, clinging to the barge on which Dante and Virgil travel. 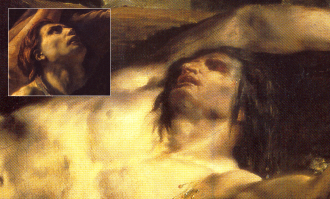 Delacroix gives a nod to Gericault, clearly indicating The Raft of Medusa as a source of inspiration for The Barque of Dante. It is a wonderful example of two young artists - both in their twenties at the time, taking bold steps to create revolutionary images. This is no better illustrated in Delacroix most famous work, Liberty Leading The People (1830), which became the a cultural icon almost overnight and is held in deep regard by the French to this day. It depicts a stylised image of the events of the July Revolution of 1830. 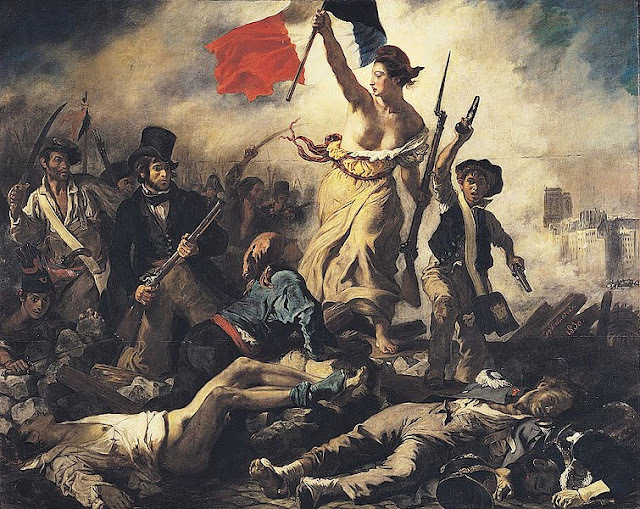 Delacroix most famous painting is now considered a national treasure in France, and can be viewed at The Louvre, Paris. 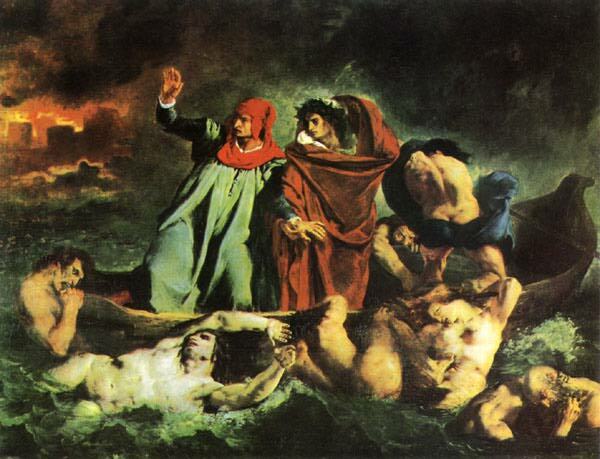 Delacroix choice of a scene from Dante was viewed as quite novel at the time of its creation. The Commedia was a Medieval work, whereas alot of Neoclassical subject matter made allusions to, or directly depicted Ancient Greece and Rome. It was a great choice, with the scene in question providing a dramatic, action filled moment worthy of a film still. These factors allowed Delacroix image to not only capture the public's attention, but also showcase the newly emerging Romantic Style. The only tender element of the image is Virgils steadying hand on Dante's. A touching representation of the affinity of these two great Men of Letters. It could be argued that this affinity was representative of the brotherhood felt by Delacroix to other young artists like Gericault. The stylised wreath-wearing Virgil guides Dante through the River Styx as the pair travel to Hell. The billowing flames of the City of The Dead can be seen in the background, the smoke hanging thick in the air. The colours and technique used are a signififcant departure from the crisp lines of traditional Neoclassical painting, and demonstrate the impending peril and manic movement of the atmosphere and lost souls which clamour, kick and bite to get onto the barge. Dramatic, disturbing, revolutionary: The Lost Souls of the River Styx aren't a happy bunch. One bites the barge, another bites a fellow soul on the head and the figure in the middle kicks another away. The disturbing imagery of Delacroix composition had an almost immediate effect, with its symbolism being echoed in other portrayals of the Divine Comedy. 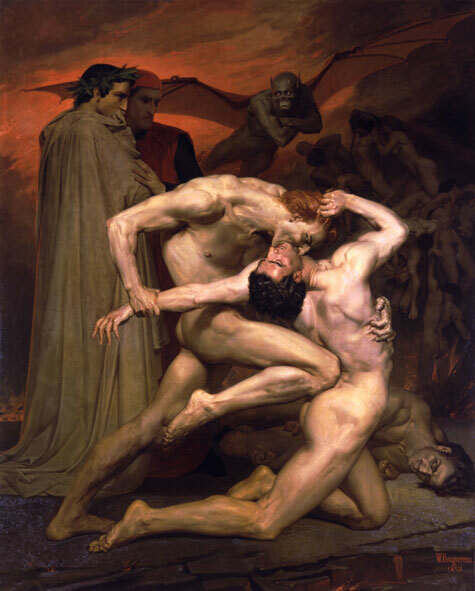 One of the most notable of these is William-Adolphe Bouguereau's rendition of Dante and Virgil in Hell, painted in 1850. Bouguereau's references to Delacroix are pretty obvious...particularly the portrayal of the biting figure and the writers steadying each other. In this instance, Dante steadies Virgil, a nice allegory for the newer artist's reverence of his predecessor. Delacroix 1822 painting had quite an effect on Bouguereau. Dante's Commedia continues to inspire creative works into the modern era. A TV Dante (1989) was a very unorthodox rendering of sections of the Inferno(Dante's journey through Hell). Directed by Tom Phillps and Peter Greenaway it polarised critics and viewers alike, including many Greenaway fans. L'Inferno is perhaps the most interesting version of the Commedia committed to film. A silent movie(obviously) filmed in 1910, it has been re-released in 2006 with a sound score provided by contemporary musicians, Tangerine Dream. Some of the most famous imagery associated with the Commedia are a result of illustrations that have accompanied published volumes. The most famous of these are those by French artist Gustave Dore, and have been compiled into a book themselves. If you ever do feel like reading the Commedia itself, ensure you have an edition containing Dore's illustration - it enriches the experience significantly. Of particular interest to fans of art history and of Delacroix in particular - he was one of the first artists to keep a comprehensive journal which was publicly released - it is an amazing read. A currently available version is published by Phaidon, compiled/edited by Hubert Wellington. Reading this work, you get to follow his thoughts as he plans amd executes some of the most famous images of European Art. Highly Recommended! That was a nice post bringing together art, literature and history. A friend of mine is writing an historical novel set in 19th century France and she recently spent three months in Paris for research. Her blog is filled with posts about Gericault and Delacroix. You might be interested in reading her blog. Thank you for adding a link to my blog. I shall return the favor. Hello Linda! Thank you for the positive comments :) I love the links between Art, History and Literature. Thanks for the link to Molly's blog - great stuff!! I came looking for paintings of Virgil and was taken away on an amazing journey of Medieval literature and 19th Century art. Thank you. This was such an interesting post! Thank you so much for suggesting it for the Art History Carnival. I'm pleased that we were able to include it in this months edition. Be sure to stop by and see the other articles that were featured in the carnival! Cheers Margaret! It was an honour to be selected - and I am very much delighted at the new Art blogs I have discovered your carnival. 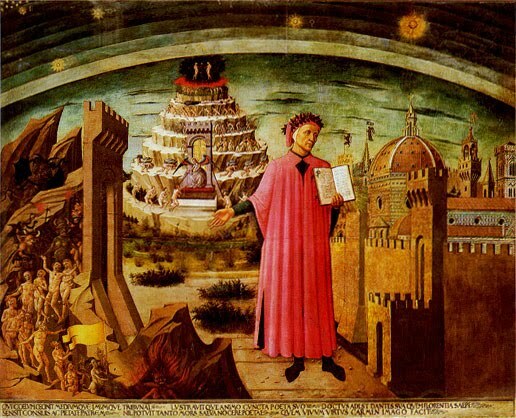 Excellent - I will use some of the art when introducing Dante to 11th and 12th graders! I've just started a more comprehensive study of renaissance art and am thrilled to have discovered your blog. This is a truly great way to tie in Dante with Delacroix.